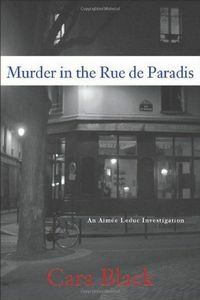 Murder in the Rue de Paradis by Cara Black: Synopsis and Online Purchase Options. Synopsis (from the publisher): Aimée Leduc is thrilled when her one-time lover, Yves Robert, an investigative journalist, returns from his assignment in Egypt and proposes marriage. She accepts and Yves places a Turkish betrothal ring on her finger. But after a single night of bliss, he meets a dreadful fate. The next day, Aimée is summoned by the Brigade Criminelle to identify a corpse found in a doorway in the Rue de Paradis. It is Yves. According to a witness, his killer was a woman in a chador. Determined to avenge her lover's death, she ventures through Paris's Little Istanbul district. The trail leads to a sleeper jihadist and she becomes embroiled in Turkish-Kurdish political controversy.